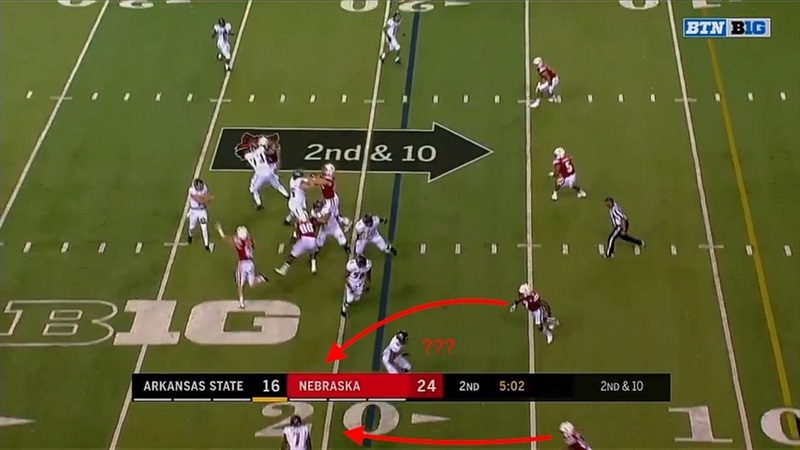 Nebraska's season-opener against Arkansas State was... odd. Safeties, return touchdowns, onside kicks – the 43-36 win had it all. But, above all else, the 415 passing yards by the Red Wolves have stuck in the craw of Nebraska fans despite Nebraska coming out on top. Nearly one-fourth of those yards came on screen plays. 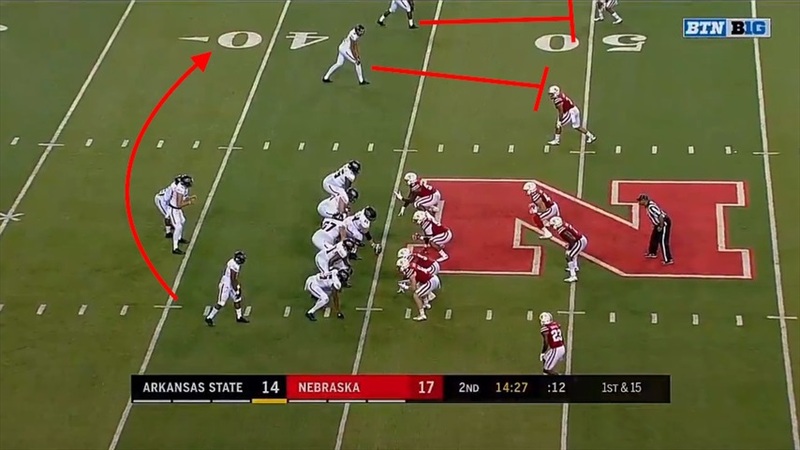 Arkansas State ran 15 screens – connecting on 14 of them – for 100 yards as Nebraska was content to allow underneath throws in the name of preventing big plays down the field. 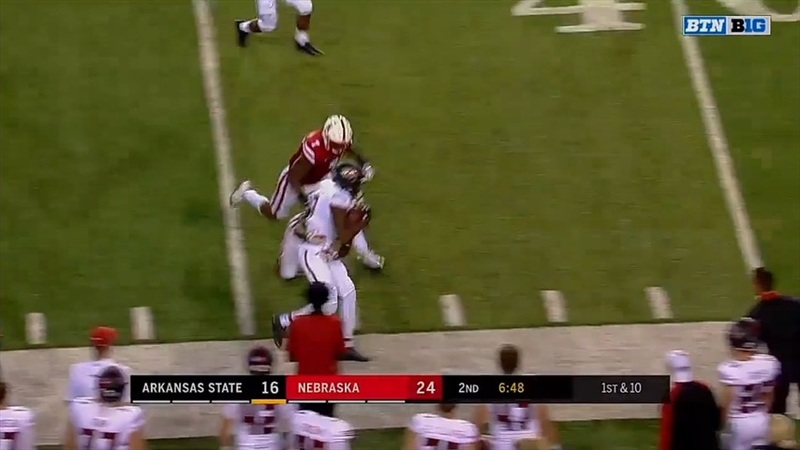 Arkansas State tore Nebraska apart with screens in the first half as a whopping 13 of quarterback Justice Hansen's 36 pass attempts in the first half were on screen plays. Nebraska struggled to defend them through a combination of the lineups on the field, the positioning and individuals failing to make plays. However, the Huskers did improve as the half went on and the Red Wolves only attempted two screens in the second half. 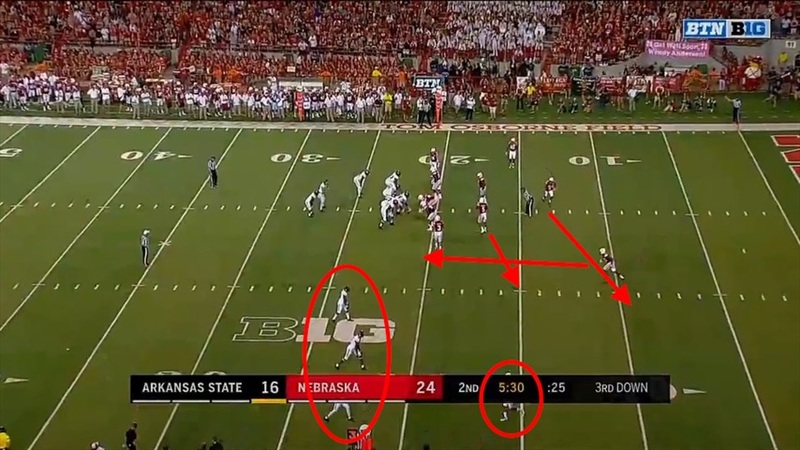 Let's dive into the film to see what went wrong and how the Huskers fixed those issues. 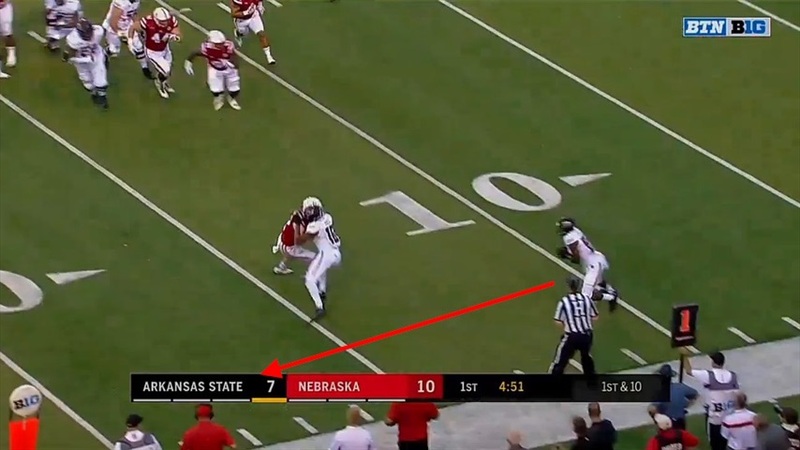 The receiver dropped the pass on Arkansas State's first attempted screen, which proved to be the only incomplete pass of the day on that play type. The first completion came on the Red Wolves' second drive, although it backfired because of a clipping penalty. On second and 8, the result was a gain of 3 but a loss of 15, setting up second and 20. Arkansas State ran another screen on the next play. 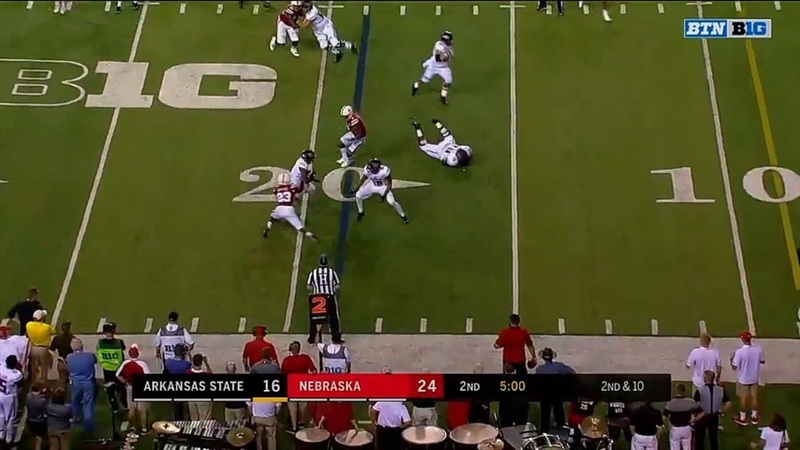 Most of Arkansas State's screens started with a play-action fake, as you can see below. 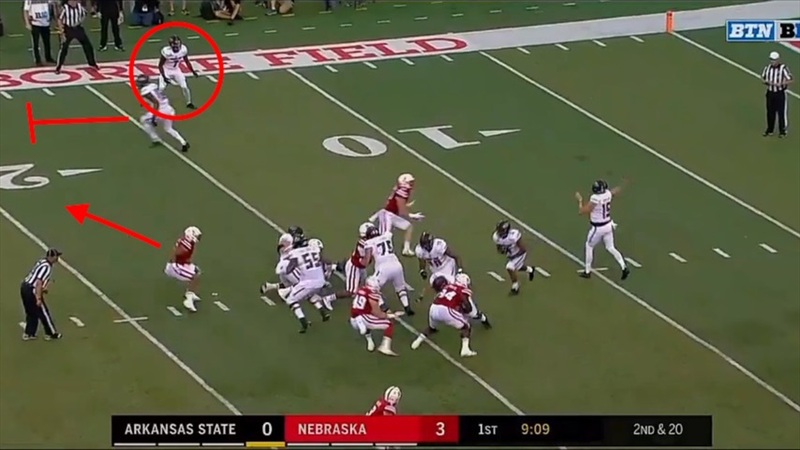 Nebraska sent Luke Gifford rushing off the edge instead of dropping back into coverage, and the inside linebacker – Dedrick Young II – got sucked in by the fake hand-off. That leaves cornerback Eric Lee Jr., who is lined up 10 yards off the line of scrimmage and therefore isn't even on the screen here, as the only defender to guard two receivers to the boundary side. The inside receiver runs down to block Lee while the outside receiver catches the pass from Hansen. Young realizes his mastake and tries to change directions, but he can't get there in time to make an impact. Hansen gets the pass out before Gifford can get anywhere near him. Lee can't get off his block to come forward and the receiver cuts inside. Young is not fast enough to get there. Lee finally manages to get off his block to make the tackle from behind as Young and safety Aaron Williams both close in as well. 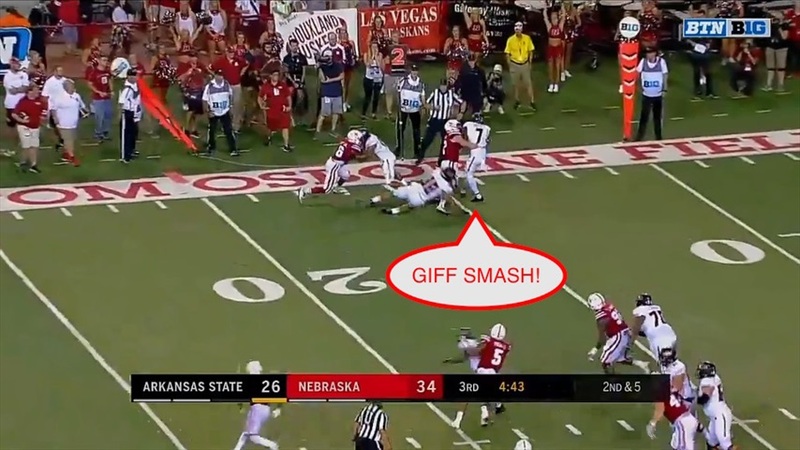 The play goes for a gain of 10 yards – not terrible considering the situation – but it still shows Nebraska's struggles to get off blocks as well as how smart some of the screen calls were against the way Nebraska was lined up on defense. 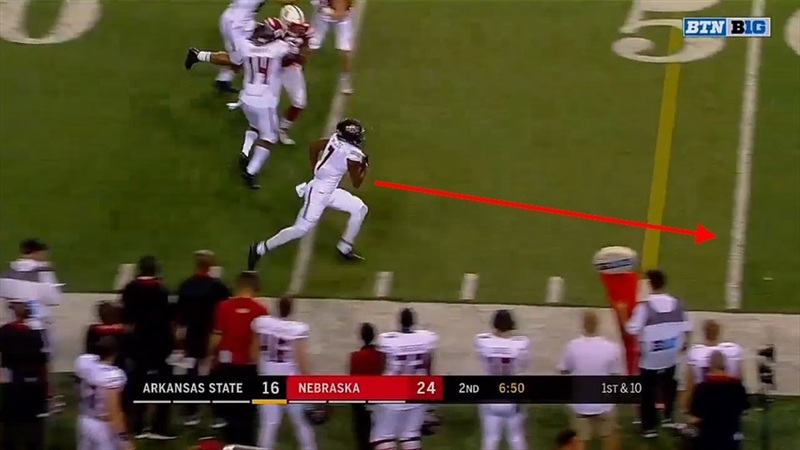 Arkansas State gets a little wacky on this drive, running screens on five of the nine plays. 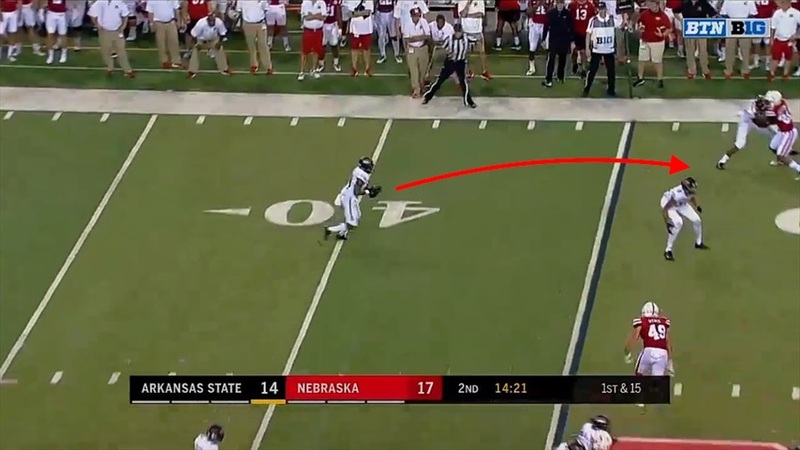 On the first play of the drive, Hansen motions a receiver from the field side over to the boundary, giving Arkansas State two receivers on each side. Again, Lee is lined up 10 yards off the line of scrimmage and just inside the numbers. 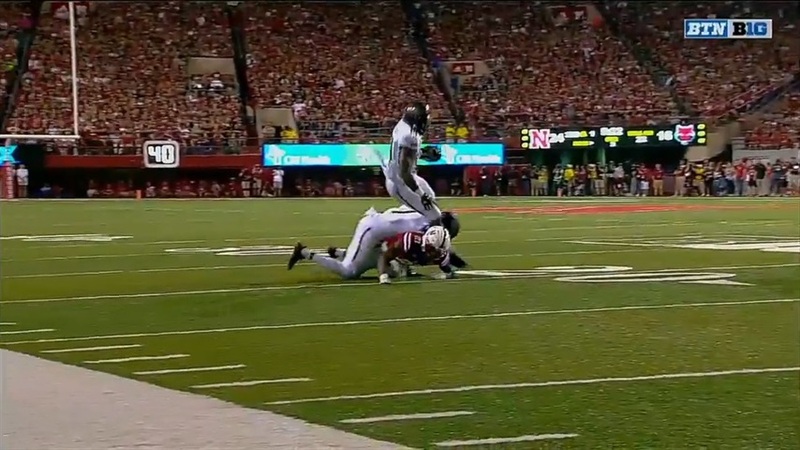 Gifford is out wide. Nebraska runs a safety blitz from the field side. The blitz does nothing as Hansen gets the ball out in less than two seconds. With Lee so far back, Gifford has two receivers to defend but gets caught on a block. The other receiver has an open lane up the sideline. Lee comes forward to make the play, knocking him out of bounds just shy of the marker. Arkansas State picks up 9 yards on first down. Once again, the cornerback is playing too far back and the other defender can't beat a one-on-one block, giving the Red Wolves easy yardage. 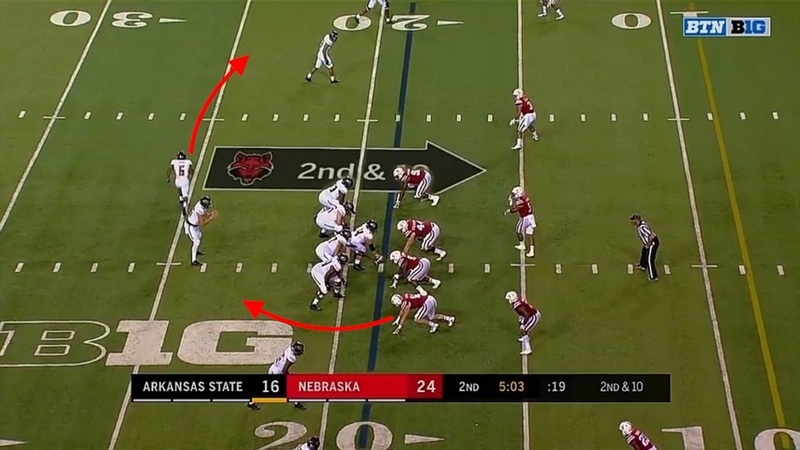 Arkansas State ran almost the same play on the next snap, picking up another 9 yards as the blocker clears out Lee and the linebacker – Mohamed Barry – has to fly to the sideline to make the play. Two plays later, on second and 3, Arkansas State runs another screen and picks up 4 more yards. Arkansas did not block it very well at all and Antonio Reed played it fairly well, but after giving up 7 yards on first down it didn't matter. Arkansas State ran two more screens on the drive, picking up 7 yards both times, and followed it up with the wheel route for a touchdown that put the Red Wolves up 14-7. 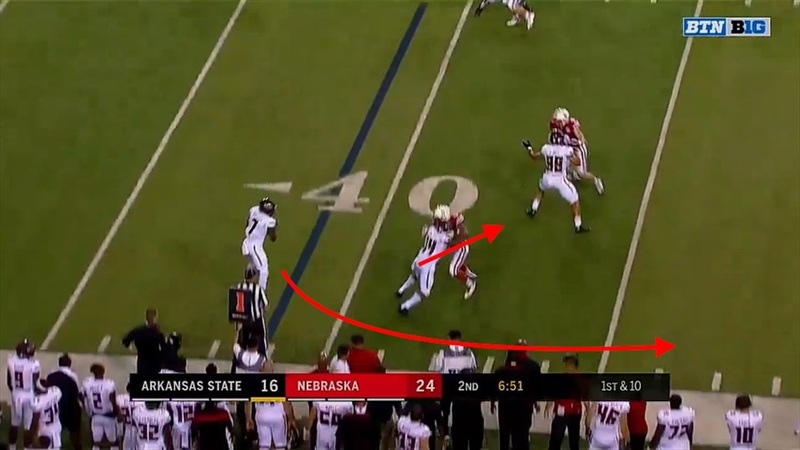 Moving along to the second quarter, following a false start (on what was going to be another screen) that set up first and 15, Hansen again motions one receiver to the other side of the field, giving Arkansas State three receivers compared to two defenders – a cornerback and a linebacker – for Nebraska. Nebraska doesn't adjust at all. The two receivers head down field to block for the motion man, to whom Hansen quickly throws the ball. The outside receiver occupies Lamar Jakcson. The other blocker takes on Marcus Newby. Jackson gets washed inside, opening up the sideline and eliminating Chris Weber, who chased down the play from his inside linebacker spot and might have made the tackle if Jackson had held his ground. Safety Joshua Kalu flies over to knock the receiver out of bounds, but what could have been easily contained to a few yards picked up an extra 5. On first and 15, allowing the underneath throw was fine. 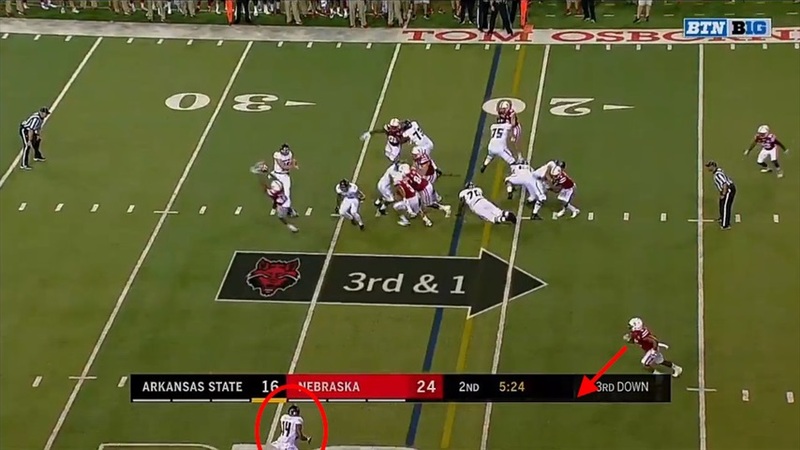 But the defenders could not get off their blocks and Arkansas State picked up eight yards. Fortunately, Hansen misfired on the next two plays, leading to a punt. This was another screen-heavy touchdown drive as three of the 10 plays were screens. However, Nebraska finally showed some improvement on the last two even if they did not result in the Huskers getting off the field. 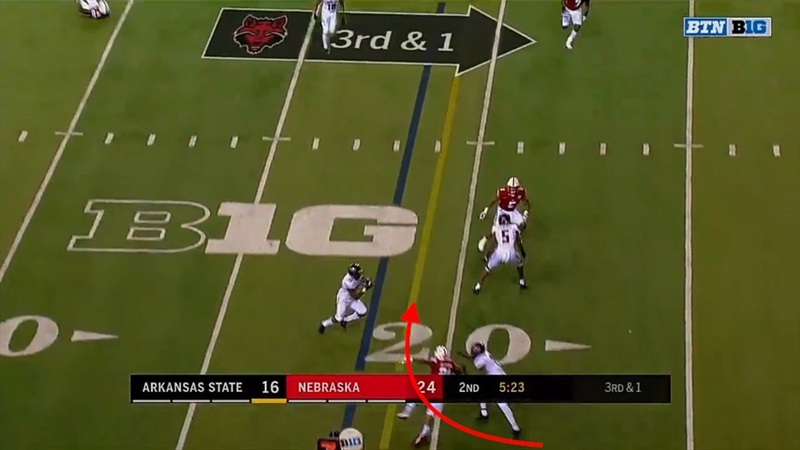 On the first play of the drive, Hansen motions the receiver to the boundary side once again, giving Arkansas State trips against Gifford wide and Lee 10 yards off the line. The two receivers engage with Lee and Gifford and the motion man catches the ball then turns up field. The Red Wolf blocking Lee completely washes the sophomore out of the play, opening up the sideline. The receiver runs past his blocks and has nothing but green turf ahead of him. Aaron Williams finally forces him out of bounds but not before he picked up 18 yards. 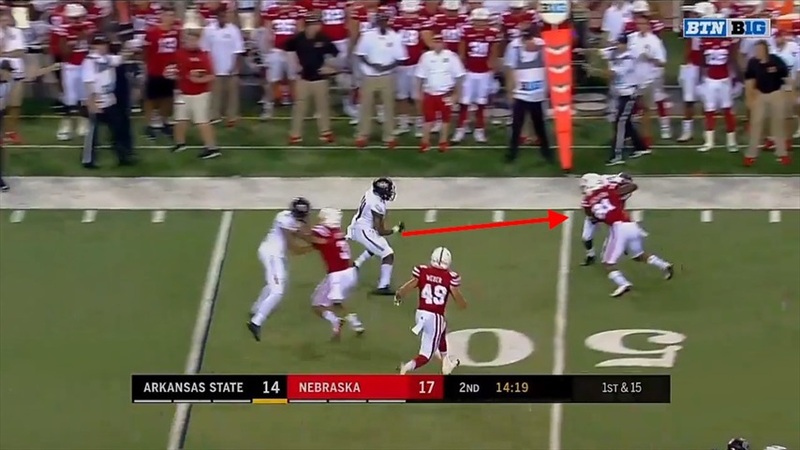 This was one of Arkansas State's biggest plays and it started behind the line of scrimmage. Three plays later, on third and one, Arkansas State ran another screen. 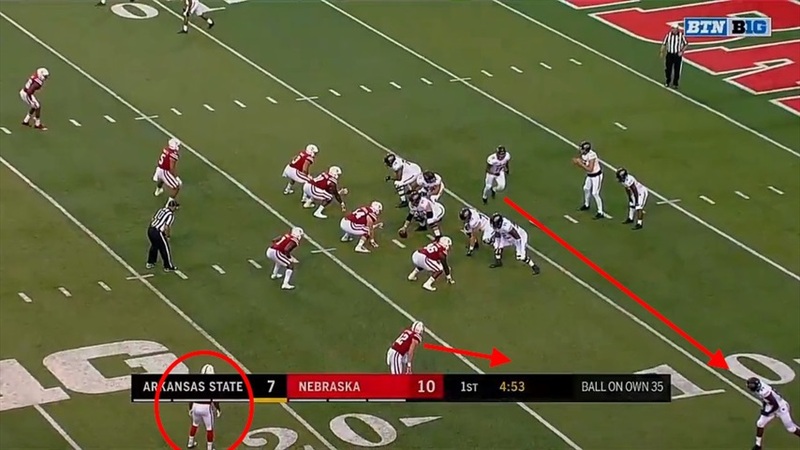 The play ended up moving the chains, but it actually showed progress by the Blackshirts. Arkansas State lines up with trips receivers to the field side with Jackson the sole corner playing 5 yards off the line. Bob Diaco dials up a safety blitz as Kalu rushes in from the secondary while Aaron Williams and Young rotate over to the field side. 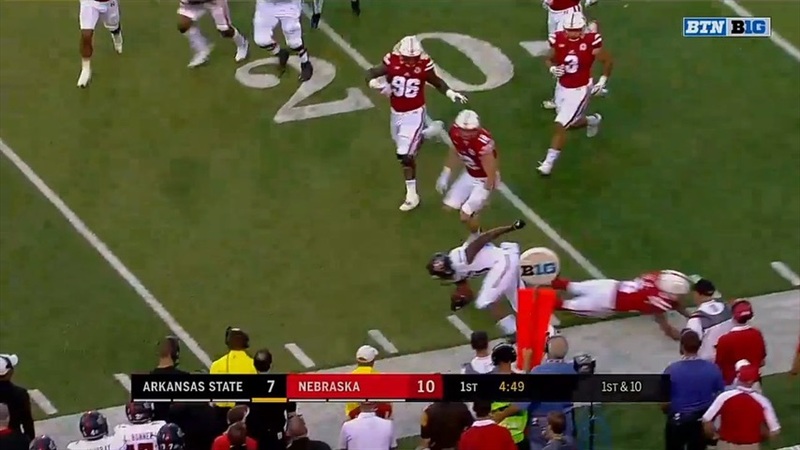 Hansen just barely gets the pass out in time and avoids the blitzing Kalu. Young is too far away to do much. And dives to the turf to trip up the receiver. The play goes for 3 yards on third and 1, but Jackson showed a highler level of awareness and physicality than any of the corners had to that point against the screen. 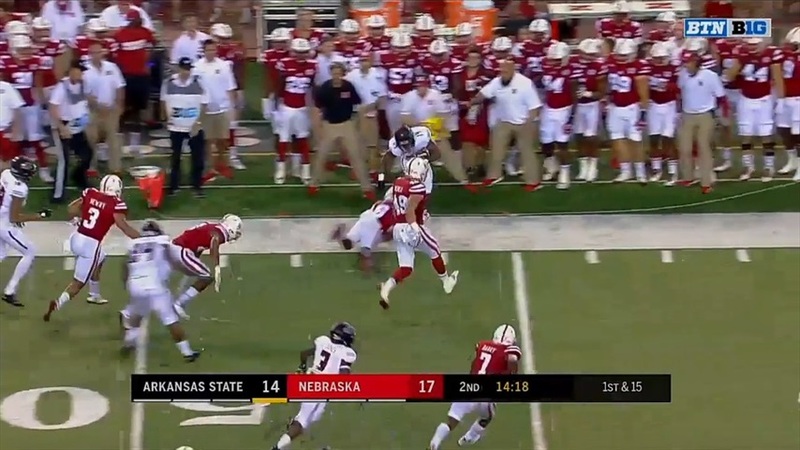 Hansen's pass fell incomplete on the following play, and Arkansas State went back to the screen on second down. 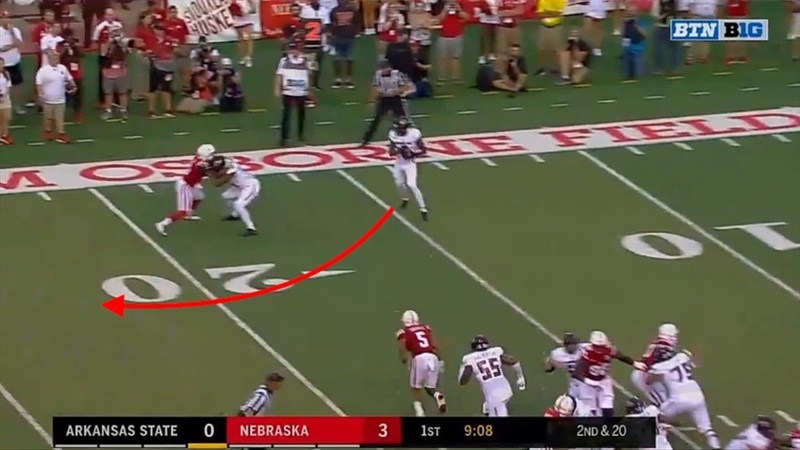 Hansen motioned his running back out to the field side and Nebraska sends Gifford after the quarterback from the boundary side. 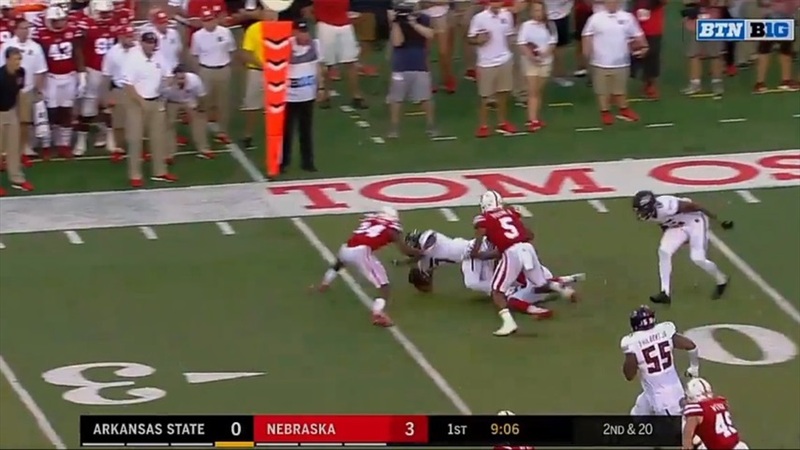 Hansen releases the ball before Gifford gets there, but Nebraska plays it a bit more aggressively than earlier as both Barry and cornerback Dicaprio Bootle diagnose the play. 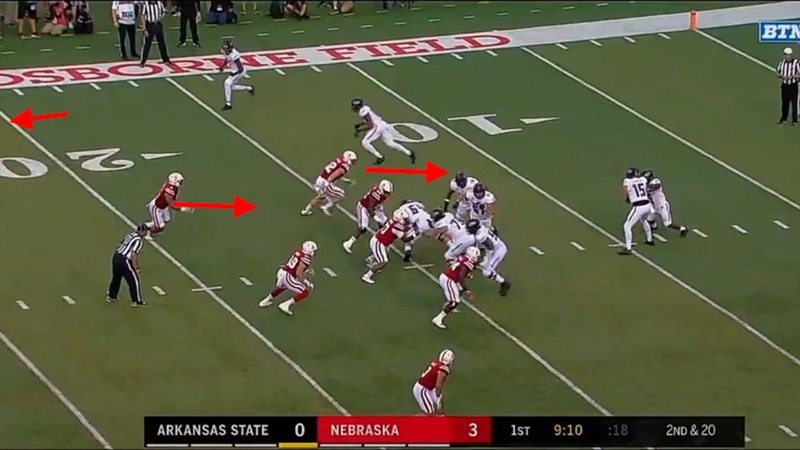 Arkansas State only has one blocker this time, and he's unsure about which man to block. The blocker's uncertainty allows Bootle to blow by him to take the receiver down at the line of scrimmage. 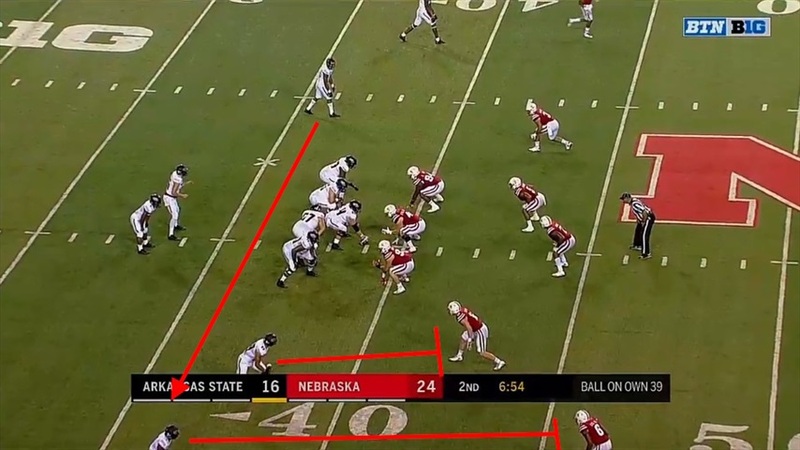 Nebraska's aggressiveness resulted in no gain on the play. The Red Wolves ran one more screen on their final play of the first half, targeting Eric Lee. The corner did not get off the block, but he did hold his ground rather than getting washed out of the play again and limited it to a gain of 6. Nebraska controlled the ball for most of the third quarter. Arkansas State didn't even attempt its first screen of the second half until there were about five minutes left in the third quarter, and Gifford sniffed it out and blew right through the block to stop the play after 1 yard (remember Bob Diaco talking about block destruction before the season?). The last screen came early in the fourth quarter. Arkansas State motioned to trips again and Jackson held his ground against his blocker and limited the receiver to a gain of 5. A lot of Arkansas State's success with screens came because of the match-ups Diaco's defensive lineups and play calls resulted in. Arkansas's motions and formations produced a lot of advantages in terms of numbers, and based on what the coaches said after the game, that was somewhat by design. They wanted to make Arkansas State string long drives together, and to the Red Wolves' credit, they did just that. But putting the scheme aside, Nebraska's young corners and its linebackers were put in some tough situations, which should only help them down the line. They struggled early and gave up more yardage than the coaches probably would have liked, but by the end of the first half they had figured it out and started to play more aggressively. 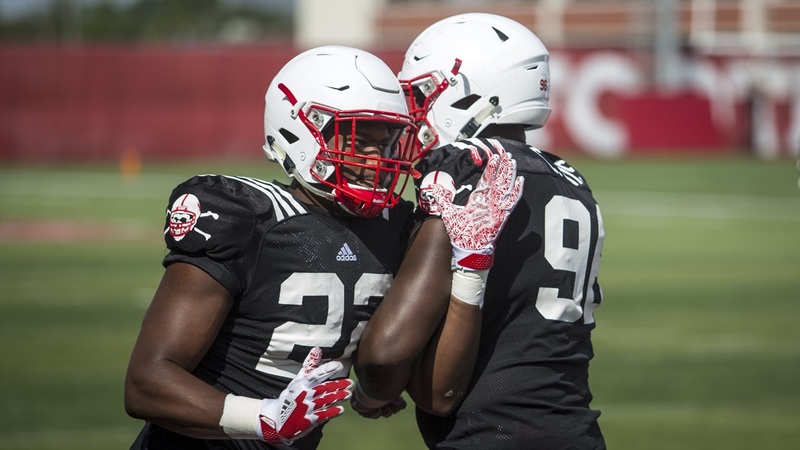 The first game of the season is always a learning experience, and Nebraska's corners and linebackers had plenty of opportunities to learn and improve against Arkansas State.